Angel Heart International’s 10 year anniversary celebration was held on February 4th, 2017 at Pacific Academy. The room was filled with over 200 excited guests who came from around the country and from China for this special night. Guests included some of our many volunteers, donors, past board members, and organization supporters. The concert began with a beautiful candle-lit singing performance of “Fill the World with Love.”Following the opening piece, Pacific Academy Principal, Keith Corpus, and President of Angel Heart International, Jennifer Yang, welcomed the guests. Concert hosts Kelly Chu (Director of Pacific Academy) and Umi Garrett (one of the performing pianists for the evening) introduced the pieces for the night. The pieces that followed were performed by the Pacific Academy Chamber Orchestra and pianists Umi Garrett, Phoebe Pan, and Allison To. Each performance was dedicated to a special group of people who had volunteered their time for AHI such as our doctors in China, our gracious donors, our founder Dr. Lee, and our volunteers in China and in the US. A beautiful slide show was played during each piece, recognizing the group of people whom the piece was dedicated to. One of our special guests of the night was Dr. Tao You, the Director of the Department of Cardiovascular Surgery at the Gansu Province People’s Hospital in China. He highlighted the importance of AHI’s and the hospital’s joint effort to bring care to underserved children. The doctors and nurses from Gansu who could not make it to the celebration that night shared their heartwarming messages via video. Christine Fontana, a representative from Edwards Lifesciences, also shared her excitement and congratulations for the years of successful collaboration between our organizations. 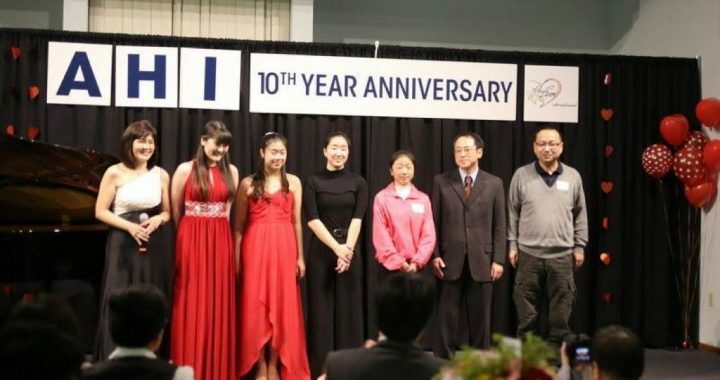 Mrs. Niu was recognized for her dedication as a volunteer for Angel Heart for 10 years, and former Angel Heart president Alina Yang spoke from her experience as our organization’s first student volunteer. One of our past patients, Lina Zhu, had also traveled from China to speak on behalf of AHI’s patients and families. As a representative for the children AHI has helped, she expressed her gratitude and hope for many more 10-year milestones to come in AHI’s future. Having experienced such care and support through AHI, Zhu Lina became a volunteer for the organization as well. She described how the love that she received from AHI inspired her, and she hopes to share this love with others in the same way. In a touching moment, Zhu Lina was reunited with US volunteers Michelle Ding, Jennifer Yang, and Tianyi Chen, who met her as volunteers but became her good friends. They had supported her and her family as she prepared for her surgery back in August 2009. A total of $40,000 was raised during the event, giving many more children the opportunity for a brighter and more vibrant future. Your support and compassion has made AHI’s mission possible these past 10 years, and we remain committed to providing love and care to our growing AHI family in the coming years. Thank you for being with us!